Open Water Swim Coaching in London with Turner Swim at the Docklands Sailing and Watersports Centre, Canary Wharf. Join us for open water swim coaching at the Docklands Sailing and Watersports Centre near Canary Wharf, London. We are delighted to be working May to August at an accredited Sh2out venue. Changing rooms, hot showers and towels for all, with wetsuits available to borrow too. All of our coaching sessions are with either British Triathlon coaches or STA Level 2 open water swim coaches. So whether you are after group, or a private one-to-one open water swimming coaching session, we’ll help you to reach your swimming and triathlon goals. Join us and it will make training for events such as the AJ Bell London Triathlon, the Windsor Triathlon, or the Ironman series easier and more enjoyable! We are delighted to announce we have an extended offering of group open water swim coaching sessions for the May to August 2019 season, with 14 different 1 hour modules available. Group sessions have a maximum of 6 swimmers per coach. Modules 1A to 4A are designed for swimmers who can swim at least 50 meters but have no previous experience in open water. We call this our pool-to-dock programme, which is basically open water swim coaching for beginners. It is highly recommended to attend all four of these initial sessions to gain a good foundation in open water swimming. If you do have previous experience we will see you in Module B! Modules 1B to 10B are for adults who already have open water swimming experience. Many clients join us as we provide open water swim coaching for swimmers and triathletes looking to gain the competitive edge. Each module is a stand alone 1 hour session and you can pick and choose the modules you would like to attend. Sessions 1B-6B have an individual focus on a specific element of stroke technique as well as stamina building longer swim sets. Prices: 1 hour sessions are priced at £30.00, 5 x one hour package is £125.00 and a 10 x one hour package is £230.00. Wetsuit use, changing rooms, hot showers and any other kit we need is all included. Bookings are now available by clicking here. Wednesday 1 May at 7:30am (CURRENTLY FULLY BOOKED), Wednesday 5 June at 07:30am. Wednesday 8 May at 7:30am (CURRENTLY FULLY BOOKED), Wednesday 12 June at 07:30am. Wednesday 15 May at 7:30am, Wednesday 19 June at 07:30am. Wednesday 22 May at 7:30am, Wednesday 26 June at 07:30am. Although it is not compulsory, it is hugely beneficial to come to the first swim of the season to get back into open water mindset. Friday 3 May at 7:30am, Wednesday 29 May at 7:30am. Friday 10 May at 7:30am, Wednesday 5 June at 6:30am. Friday 17 May at 7:30am, Wednesday 12 June at 6:30am. Friday 24 May at 7:30am, Wednesday 19 June at 6:30am. Friday 31 May at 7:30am, Wednesday 26 June at 6:30am. Friday 7 June at 7:30am. Wednesdays 8, 15, 22, 29 May at 6:30am. Friday 14 June at 7:30am. Friday 21 June at 7:30am. Friday 28 June at 7:30am. Our one-to-one open water swim coaching sessions enable us to improve specific open water swimming styles and individual swimming techniques. For many of the open water swimming topics we recommend group coaching, so that you have other swimmers around you to make the session more event specialised. However, in our one-to-one sessions we can focus on the areas you would like for you. Perhaps you are getting used to being in the colder water or would like help developing your aquatic breathing and sighting in open water. We look forward to working with you. Join us for the second annual Canary Wharf 1 Mile Swim, starting at the Docklands Sailing and Watersports Centre. This 1 mile race takes place in Millwall Outer Dock, a filming location for James Bond’s “The world is not enough”. £20.00 entry fee with times recorded by our team (no timing chip needed). 40 swimmers per heat, this is an ideal event for first timers and experienced athletes. Book your Canary Wharf 1 Mile Swim Place. We also offer year round swimming coaching for triathletes in Marriott County Hall hotel, Westminster. Set within a 25 meter long swimming pool, our triathletes off-season swimming training programme is a popular option for September through to April. Group coaching sessions are available either on our Pool-To-Dock “A modules” for those new to open water swimming, or on our “B modules” for those with open water swimming experience. Our “Pure Swim Fitness” sessions are available weekly from May to August. Turner Swim are London’s one-to-one adult swimming coaching specialists. Having run one-to-one swimming sessions since 2013, we have coaches to suit your level of swimming and goals. In 2018, Coach Andrew swam the Bosphorus and River Dart 10k. 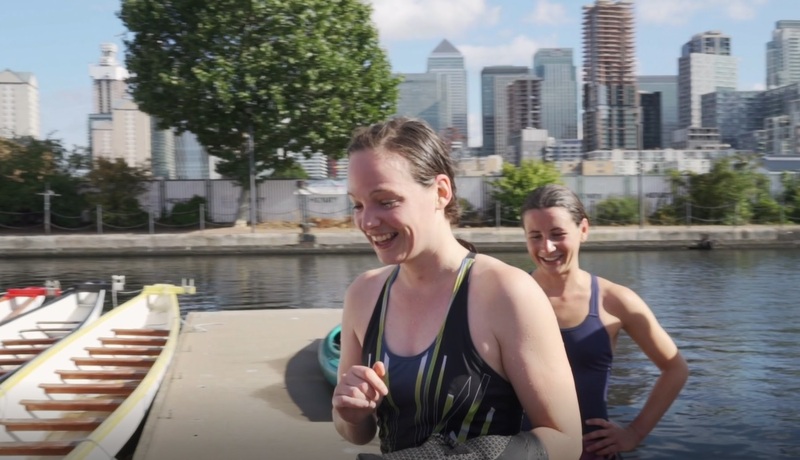 Our open water swim coaching sessions take place in Millwall Dock at the Docklands Sailing and Watersports Centre, by Canary Wharf. Large changing rooms, hot showers, shampoo, wetsuits to borrow and towel use included too. Our DSWC venue is a Sh2out approved safe open water swimming sessions site. Sh2out, is run by British Triathlon and the RLSS to “develop existing infrastructure to ensure a safe and enjoyable environment for new and existing swimmers”. Source: [https://www.sh2out.org/about-us/the-partnership] Accessed 23 March 2018. BOOK NOW and secure your open water swim coaching place!